At first glance the Sony Cyber-shot DSC-W200 looks like a fairly run-of-the mill compact camera, with an understated, compact silver body, 3x zoom lens (35-105mm) and 2.5 inch LCD screen. Look a little closer though, and you'll find that there are some more impressive stand-out features. Most obvious is the headline-grabbing 12 megapixel resolution, now the standard for any self-respecting top-of-the range compact like the W200. Next up is true optical image stabilisation via Sony's Super SteadyShot technology, which combined with the extensive ISO range of 100-3200 promises to make blurry photos a thing of the past. The Sony W200 also offers a true Manual shooting mode which allows you to set both the shutter speed and aperture, and there's also an optical viewfinder for ease-of-use in bright sunlight. The Sony Cyber-shot DSC-W200 is therefore a mix of humdrum and rather more exciting features, on paper at least. Mark Goldstein tested the W200 in the short, dark days of an English winter to find out how it coped out in the real world. The Sony Cyber-shot DSC-W200 is a fairly compact digital camera that fits into the palm of my average sized hands, measuring 91mm (W) x 58.5mm (H) x 27.3mm (D) and weighing around 140g without the battery fitted. This is a camera that you won't notice carrying in a trouser/shirt pocket or a handbag. With an all-silver aluminium alloy body, it's slightly heavier than it might look at first glance, and it's also exceedingly well built. The W200 has a boxy, under-stated appearance that is fairly attractive, but which isn't going to really wow anyone either. The 3x zoom lens is equivalent to 35-105mm, disappointing given the recent trend of wider-angle standard zoom lenses, and the maximum aperture of f5.5 at 105mm is also rather slow. Most people will probably use the Sony Cyber-shot DSC-W200 as a purely point and shoot camera, in either the Auto, Program or one of the Scene shooting modes. There are just 9 external controls in total, located on top of the body and to the right of the LCD screen (as viewed from the rear). Some of the buttons follow the usual Sony tradition of being on the small side, but overall the user interface is cleanly designed and intuitive to use. The only things I didn't like so much were the battery compartment cover, which feels flimsy when open, and the rather spongy joystick control in the middle of the navigation pad. The Sony Cyber-shot DSC-W200 does have a trick up its sleeve that will appeal to the more experienced photographer. The Manual Exposure (M) shooting mode does exactly what it says on the tin - namely it allows you to set both the aperture and shutter speed and assume full control. Set the Mode Dial to M, press the joystick control and then use left-right on the navigation pad to set the aperture and up/down to set the shutter speed. The camera displays an EV read-out at the bottom of the LCD screen to indicate if it thinks the scene will be under or over exposed, based on the settings that you have chosen. There are a couple of things to note. Most importantly there are just 3 possible apertures - for example, f/2.8, f/5.6 and f/8 at the wide-angle lens focal length - which reduces the amount of control that you have over depth-of-field. Secondly, it's not the most intuitive system in the world due to the fiddly controls and rather small text on the LCD screen. Thirdly and most importantly, it's only going to appeal to a certain group of users who really know what they're doing. I would have liked to have seen Aperture-priority and Shutter-priority modes too, which would have provided a more gradual learning curve for less confident owners. Also appealing to more experienced photographer is the true optical viewfinder, now something of a rarity on compact digital cameras. Although it's quite small with no information displayed, the viewfinder is very useful in bright sunlight when the LCD screen becomes difficult to see, or when you want to compose the image by holding the camera up to your eye. It's rather strangely positioned at the top-left of the camera (looking from the back) and doesn't provide full coverage of the scene, but it's definitely worth having despite these shortcomings. There is an innovative feature on the Sony Cyber-shot DSC-W200 that aims to make life easier for you. This camera has an optical-based anti-shake system called Super SteadyShot. Turn it on and the Sony Cyber-shot DSC-W200 automatically compensates for camera shake, which is a slight blurring of the image that typically occurs at slow shutter speeds. You don't notice that the camera is actually doing anything different when anti-shake is turned on, just that you can use slower shutter speeds than normal and still take sharp photos. Sony seem to have realised the importance of this system, as it is turned on by default in the menu system. You can see some example of the Super SteadyShot system in action on the Image Quality page. Thankfully leaving the anti-shake system on didn't negatively affect the battery-life, with the camera managing over 275 shots before the battery needed to be recharged. After a lot of hunting around , I discovered that the Face Detection feature offered by the Sony Cyber-shot DSC-W200 is only available when you select the Soft Snap scene mode, a strange decision that severely limits its usefulness. Most other cameras allow you to turn it on of off in the majority of shooting modes. Also Face Detection only really works if the subjects are looking directly at the camera, and the W200 takes a while to lock onto the subject. Overall it seems like a rather half-hearted implementation, so much so that the tried and trusted method of half-pressing the shutter button to focus and then recomposing the shot is a quicker and more reliable method. If you have never used a digital camera before, or you're upgrading from a more basic model, reading the comprehensive and understandable manual before you start is a must. Unfortunately Sony have chosen to cut costs and supply the full manual as a PDF on the product CD, rather than in printed format. Only a brief 40 page guide to the basic operation of the camera is supplied in printed format. The 2.5 inch LCD screen has a disappointingly low resolution of 115,000 pixels, which results in a rather grainy on-screen image and is out-of-place on a top-of-the-range model like the W200. The various icons used to represent the camera settings are clear and legible, although a little on the small side considering the large LCD screen. 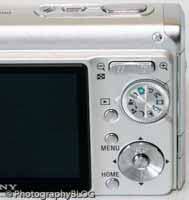 The main camera menu system on the Sony Cyber-shot DSC-W200 is accessed by pressing the Menu button on the back of the camera. 12 commonly used features are displayed in a vertical row of icons, including image size, exposure compensation, ISO speed and metering mode. At the bottom is the Setup option, which displays another 7 options in a list format that you probably won't need to change. Following the recent trend set by other new Sony compacts, there's also a Home button below the Menu button which accesses more features, including image viewing, printing and sharing options, displayed in a slick icon-based interface. Once you become accustomed to the split between the Menu and Home buttons, the DSC-W200 has a very nice menu system that suits the overall feel of the camera. 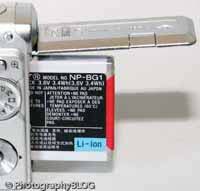 The performance of the Sony Cyber-shot DSC-W200 is good in some areas, bad in others. The start-up time from turning the camera on to being ready to take a photo is quite quick at 1.5 seconds, and it takes 2 seconds to zoom from the widest focal length to the longest. Focusing is very quick in good light and the camera happily achieves focus most of the time indoors or in low-light situations at the wide end of the zoom, but it does tend to hunt for the subject when using full telephoto. It takes about 1 second to store an image, allowing you to keep shooting as they are being recorded onto the memory card, although there is occasionally a short LCD blackout between each image. The Sony W200 has a run-of-the-mill continuous mode of 2fps, although the camera can take up to 100 shots continuously at that rate. The flash recycle time is also a little slow at around 3 seconds. 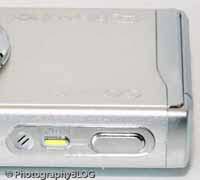 Overall the Sony Cyber-shot DSC-W200 is fairly quick in terms of operational speed. Once you have captured a photo, the Sony Cyber-shot DSC-W200 has a good range of options when it comes to playing, reviewing and managing your images. You can instantly scroll through the images that you have taken, view up to 12 thumbnails at once, zoom in and out up to 5x magnification, view slideshows with music, set the print order, delete, protect, and rotate an image. The new Retouch menu contains six creative effects of varying usefulness, including red-eye reduction which can be applied after a photo is taken. The Display button toggles some limited information about each picture on and off, including a small histogram. High Definition output for displaying still images on a HD TV is available, although this requires an optional cable, so I couldn't test it as part of this review. In summary the Sony Cyber-shot DSC-W200 is a fairly standard-looking compact camera with a number of interesting features that doesn't quite live up to its full potential in terms of design and ease-of-use. Now find out if it takes good photos by looking at Image Quality page. PhotographyBLOG is a member of the DIWA organisation. Our test results for the Sony Cyber-shot DSC-W200 have been submitted to DIWA for comparison with test results for different samples of the same camera model supplied by other DIWA member sites.